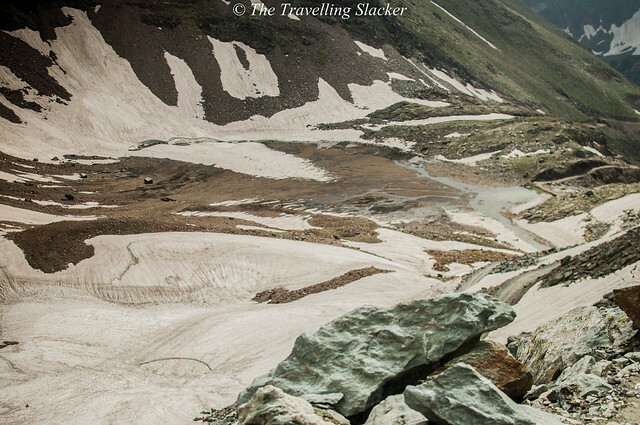 The bus started on time, moved faster than I expected, and topped Sach Pass in flat three hours from Killar. This was more than I could have asked for on the last day of my two month long trip. I was tired, especially after walking/hiking for almost 35 kms the previous day (more about that in a later story). I was somewhat surprised to see such a thick layer of snow atop the pass. Kunzum is higher and I did not see anything like this out there. But it did not bother me much. I just wanted to quickly get over this last bus ride, come out of my digital isolation, and relax for a while. 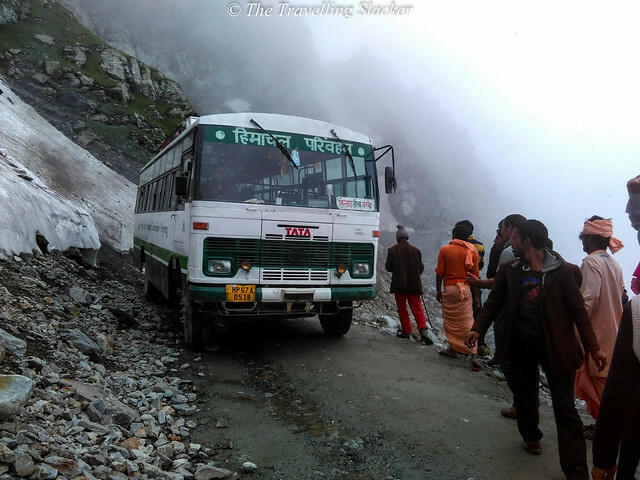 However, the bus suddenly came to a screeching halt only five minutes after leaving Sach top. There was a giant rock in the middle of the road, blocking the traffic completely. Not sure where it came from and how did it manage to not fall over the cliff further. Anyway, the driver, the conductor, and some local passengers started working on it. A group of wandering hermits were on the bus. They took out their wooden sticks to use as levers. The large rock was immovable, and frankly the only way would have been to push it down the slope, possibly killing someone else in the lower areas. So, they started clearing up the space between the rock and the rest of the mountain. After some digging through the snow, mud, and pebbles, it seemed that the bus will manage to pass through it. However, it did not work and one of the wheels got stuck. No other vehicle was to be seen and no help could be called as no phone network works up there. It was freezing and I was beginning to offer the services of my lighter in exchange of beedis. 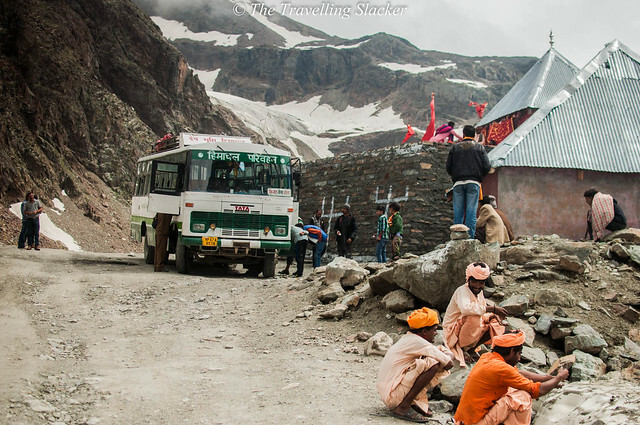 The checkpost of Shatrundi became visible through a misty wormhole but it was too far to be of any comfort. The next plan was to somehow get the bus move back, broaden the passage, and make it drivable by laying rocks over the sludge. After some hard work, the mud around the wheel was removed and the driver managed to pull it out and move back a few yards. So far, I was just cluelessly and shamelessly looking at the proceedings and taking photographs. But as everyone started to pick small pieces of rocks lying around and laying it on the mud, I also joined in. 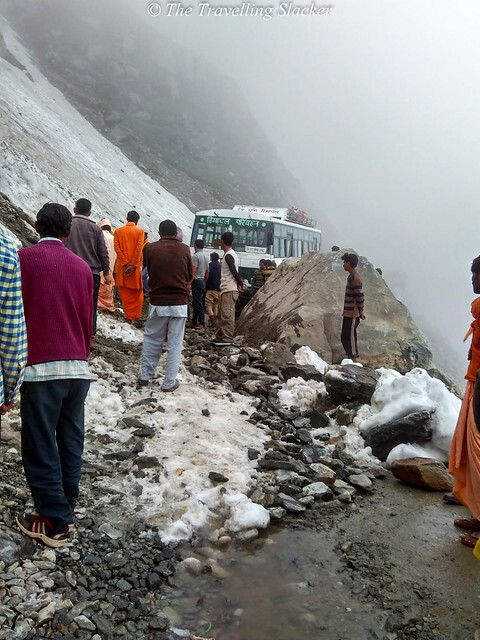 Practically, a small stretch of “road” was built with public participation at close to 4300 metres without any external help. The bus finally drove through it came out of that treacherous spot. However, the ordeal did not end there. The bus had developed other technical snags by that time. It somehow managed to reach Shatrundi but then it completely gave up! Here I must mention that Shatrundi was looking beautiful with its famous waterfall and the dhaba out there provided some much needed refreshment. 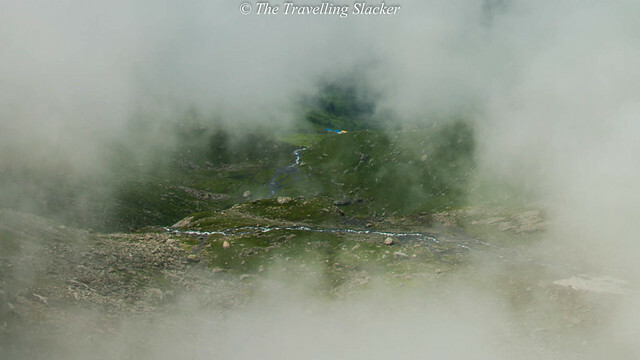 However, the sunshine did not last long and very soon the monsoon fog obscured everything. Drivers from other trucks and buses tried to help out. They fought for hours. But the bus simply refused to start. 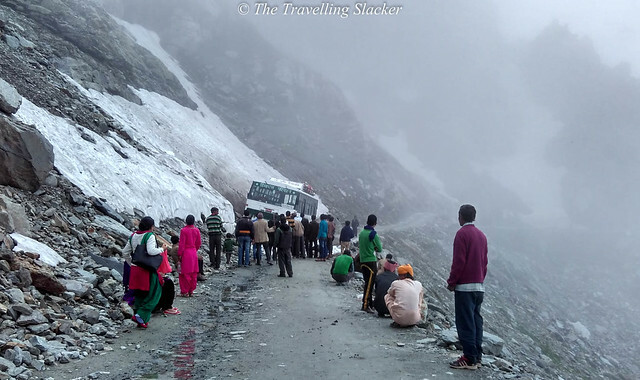 Local passengers started leaving one by one, hitchhiking other vehicles passing by. Eventually around 10 passengers remained including me. The cops at the checkpost as well as the owner of the dhaba were helpful and they suggested that we can spend the night there if needed. I was gearing up for a very chilly and uncomfortable night. Just at that point, I heard the sound of a car. I could not even imagine someone driving through the pass at 8 pm with practically zero visibility. But there it was! It was an ambulance carrying no patients. Four of us stuffed ourselves in the backside of the ambulance. I doubt if the driver could see anything either but he kept driving on instinct. From the sound of it, I felt that it passed through several waterfalls. Back in 2012, I visited the pass in early November. The waterfalls were frozen then. But that was a sunny day and gave me great photographs. 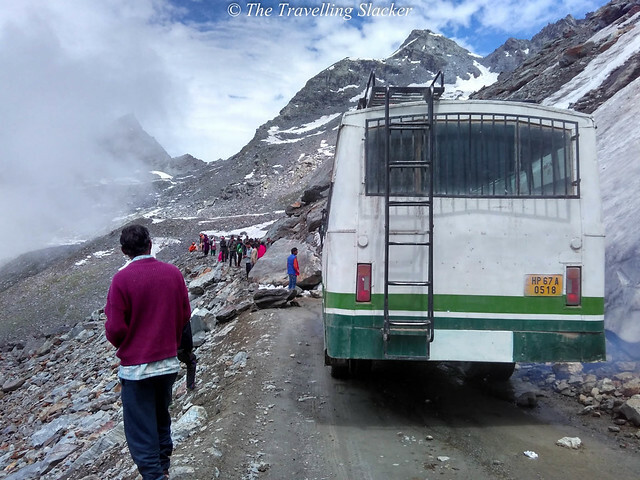 Do check out this post to see how Sach looks like at the onset of winter. After an hour or so, we reached Bairagarh. The ambulance was going all the way to Chamba but I had no stamina remaining. Besides, Bairagarh was an old favourite from the previous trip. So, I checked into the good old Mannat Homestay and retired for the day. 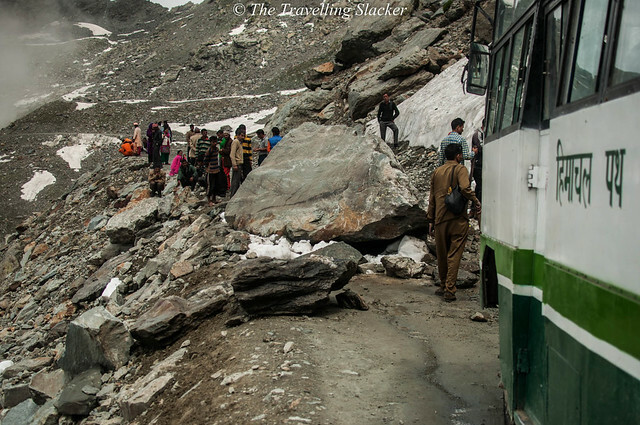 They call it one of the most dangerous roads in the world. I do not want to exoticize it that way. The reason I recount this experience is not to show what an adventure I had but to depict the day to day struggles of the locals and the HRTC drivers in these roads. They deserve better. I am thankful that a bus service even exists here. Fantastic Jitaditya bhai! I might have been a bit late to discover your blog but now that I have… I am loving every bit of it! Once again a lovely piece. You literally took me there. Sometimes nature plays its own role which we can not change even if we want to. Wow! That was an amazing post! Beautifully narrated and garnished with some lovely pictures too!! This is real adventure for HP drivers. They are the best in the world. Photographs are breath taking. Bro, really love the way you write. Do spare some time to meet me when you reach Delhi. What an adventure! 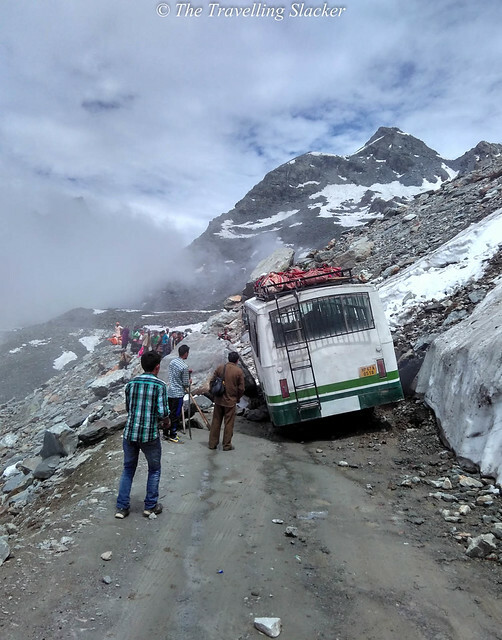 I can’t believe the bus got stuck like that and they were able to just build a new road into the side of the mountain. Must have been frustrating at the time but in hindsight its a great story to tell! My! That road looks really dangerous. Specially with the fog and bad visibility, these people risk their lives everyday! gave me the shivers. Enjoyed reading about your adventure. 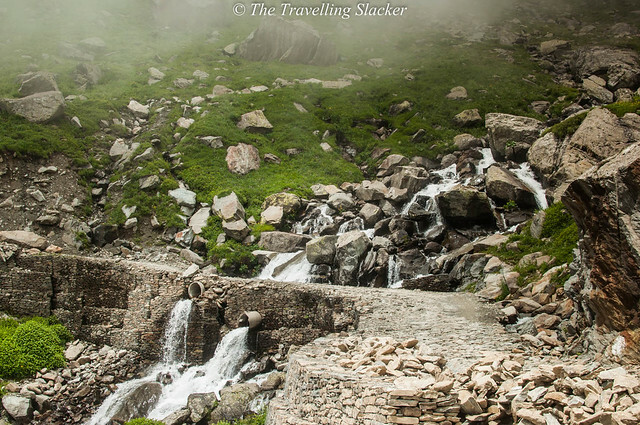 It reminded me of a road trip to Nathula Pass on the Indo-China border. Loved the landscape, so beautiful and pure. Wow what an adventure! That is a pretty crazy travel story, but like you expressed the locals certainly deserve more with better and safer roads. great post and what amazing adventure you have done!! I have got a similar experience in Myanmar crossing the border to Thailand! The road was unpaved, a bus need 3 hours to make 35 km! Is it normal?!?! I don’t think so, anyway… WE LOVE IT!! That is one HUGE rock. I’m so glad it didn’t hurt anyone. 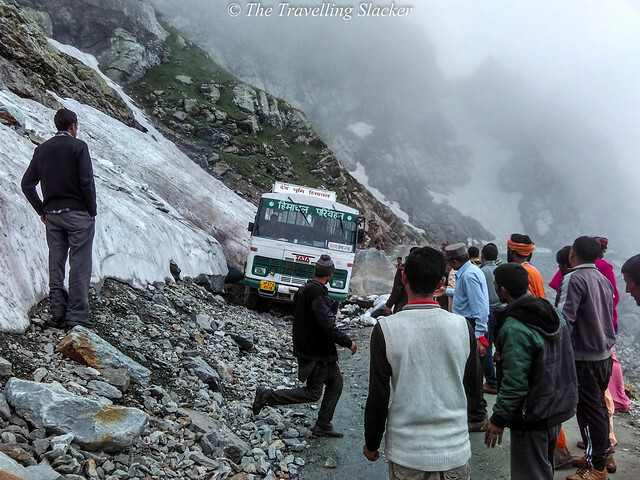 That is definitely mountain travel at one of its most dangerous times. Mother Nature surely teaches us lessons on living in the moment, doing the impossible and being creative, doesn’t she? Wow, the photos are so beautiful! Sorry that things didn’t go as planned, but at least you had an awesome adventure! Thank god no one got hurt. Thanks for sharing! Seems like an adventurous trip. 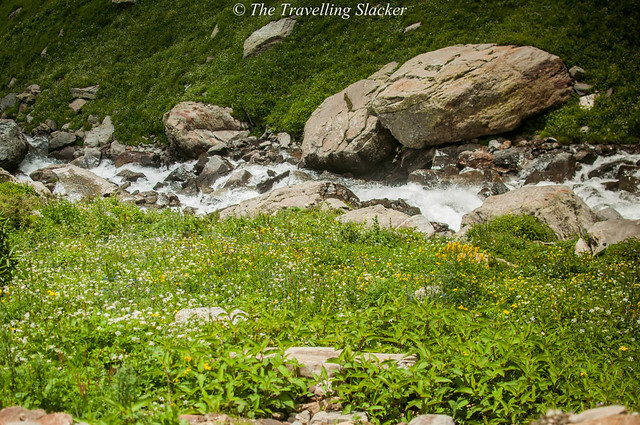 I am not sure if I would want to go here as a solo woman traveller. I have been to the HImalayas and they are stunning. I would love to revisit with a bunch a friends! Well of all the places a bus could break down, i think this was a great place. Those waterfalls were amazing! Glad you were able to make it back to tell about this great adventure. Beedis are awesome mate. I have had a few in the rural areas and think they deserve a post of their own. Its wonderful how human ingenuity triumphs adversity everytime. 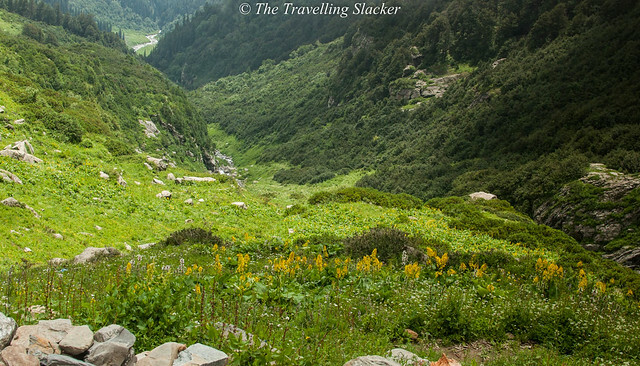 Every post I read on your blog lately just cements my decision to go travel the Indian Himalayas more and more! I’ve been to India 10 times and there’s always something that comes up and prevents me from traveling there. I will get you mountains one day!